Life is precarious in for people in the Amucha community in Southern Nigeria. Homes and farmland have collapsed into massive gullies in the earth. Soil experts say this erosion is getting worse – caused by deforestation and increasingly unpredictable weather. Ugochi Anyaka travelled to the region to see the problem and hear some possible solutions. This radio feature was produced as part of a fellowship with Climate Change Media Partnership. The CCMP is an initiative of Internews, IIED and Panos. All our journalism is free to reproduce. If you do broadcast our audio, please credit the reporter and Panos London and let us know – ideally with feedback from listeners – by emailing info@panos.org.uk. Thanks. Well Done Ugochi, this is really informative. Well done Ugochi.keep d doing d good work?but where in d southern Nigeria is Amucha n in which state is it? Amucha is in Njaba Local Government of Imo State. Thank you. The president should sign the National Climate Change Commission Bill now if only for the sake of mothers like Mary Nworji. Very.. very ok, proud of you and your work. Fantastic piece. Poignant! I find this an intensely thought-provoking rendition of the genesis of most, if not all, of the factors militating against the environment and its climate, as well as our health and the very future of humankind: On the one hand, you’ve got failed, uncompleted and abandoned projects speaking to a perniciously anaemic political and leadership status quo from one end of the earth to the other; and on the other, a global citizenry largely clueless, or in denial, and in a desperate and mostly uncoordinated scramble for survival on rapidly withering resources, thereby inadvertently perpetuating the vicious cycle responsible for climate change! Thank you, Ugo. Let’s not relent our efforts to get the word out! Amucha is my ancestral homeland and it hurts my heart to know that the neither the Imo State nor Federal Govt. have deemed it necessary to address this issue. Thank you for a great piece and for bring this to the fore front. 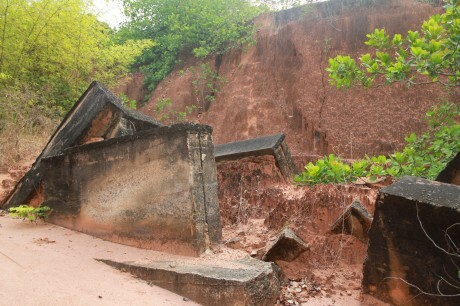 Severe soil erosion made worse by flooding has destroyed homes and farmland in Amucha, Southern Nigeria.